A Kentucky-born guitarist who learned the instrument at an early age via the Chet Atkins/Merle Travis/Doc Watson heritage, Pat Kirtley admits to having been bitten hard by the Irish music bug in the late 1980's after hearing guitarist John McCormick playing Celtic tunes in DADGAD tuning. He began exploring that tuning and channeling significant creative energy into arranging Irish fiddle tunes and airs. "I am as fascinated by the fabulous wealth of musicality represented in the Irish folk-tradition as I am by the fact that I went through most of my musical life being totally ignorant of its existence," Pat remarks. 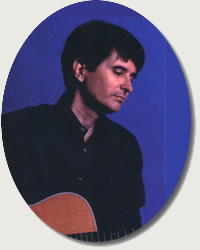 The results of that work are represented in his body of work by arrangements of "Planxty Irwin", the set dance "Rodney's Glory," and airs "Moran's Return" and "The South Wind," all appearing on his 1997 album Irish Guitar. In this DVD lesson, National Fingerstyle Champion Pat Kirtley teaches the basics of thumbstyle guitar and shows you how to play five repertoire building solo arrangements which illustrate various techniques of this exciting style! Pat also teaches and explains: the basic right hand concepts of thumbpicking, how to use the thumbpick, right hand palm muting, using the left hand thumb for holding chords, differences in the styles of Mose Rager, Merle Travis and Chet Atkins, how to play "up the neck" chords in the style of Mose Rager, and chord form variations used by thumbstyle players. Tunes include: "I Am A Pilgrim, I'll See You In My Dreams, Deep River Blues, Ready For The Times To Get Better, and The Guitar Rag"
Pat Kirtley Plays "The Guitar Rag"
In this DVD lesson, National Fingerstyle Champion Pat Kirtley presents simplified, but highly musical and exciting to play solo guitar arrangements in four different tunings! The arrangements presented were chosen for advanced beginner to intermediate skill level, and to illustrate the differences and unique features of each tuning. Pat shows you: how to tune your guitar to each of the tunings, how to get into tunings without the need for an electronic tuner, the pros and cons of alternate tunings, harmonic "chime" techniques, and right hand fingerstyle techniques. Complete instructions for each tune, with split-screen versions showing both hands, are explained and taught. Tunes include: "Battle Hymn Of The Republic" (Drop-D tuning DGDGBE), "Spanish Fandango" (Open G tuning DGDGBD), "Both Sides Now" (Open G tuning DGDGBD), "Amazing Grace" (DADGAD), and "Steel Guitar Rag" (EADEAE). Pat Kirtley Plays "Both Sides Now"
In this DVD lesson, National Fingerstyle Champion Pat Kirtley presents hauntingly beautiful solo guitar arrangements in the DADGAD tuning of six traditional tunes from Ireland and Scotland! These arrangements are designed for guitarists who are already at advanced beginner to intermediate level and want to explore a completely different musical style. The skill level progresses throughout the lesson from the very easy but melodic "Skye Boat Song" to a challenging dance tune "Boys From Blue Hill". Pat also teaches and explains: the structure and form of Celtic tunes, how to understand and play dance rhythms (jigs and reels), how to identity the different types of tunes in this genre, how to play Celtic ornaments, and ways to embellish the melody on slow pieces. Tunes include: "Skye Boat Song, Fannie Power, Moran's Return, The Blarney Pilgrim, The South Wind, Boys From Blue Hill". Pat Kirtley Plays "The Blarney Pilgrim"
Chet Atkins was a true master of the guitar! One of his greatest skills was his uncanny ability to discover songs that would "work" as fingerstyle arrangements and then use his musical genius to turn them into superb guitar masterpieces. National Fingerstyle Guitar Champion Pat Kirtley has assembled a unique collection of favorites from Chet's "Golden Era" and teaches you all the secrets of how to play them as well as how to duplicate the sound of the original recordings in this exciting DVD set! Pat carefully dissects each and every song and then puts them back together - step by step - so that you not only learn how to play them, but also get a sense of the feel and history of each unique solo guitar piece. Split-screen viewing allows you to study both the left and right hands in great detail. Tunes include: "Hidden Charm, Mystery Train, You'd Be So Nice To Come Home To, St. Louis Blues, Oh By Jingo, Chinatown My Chinatown". Pat Kirtley Plays "Hidden Charm"
Chet Atkins was a true master of the guitar! One of his greatest skills was his uncanny ability to discover songs that would "work" as fingerstyle arrangements and then use his musical genius to turn them into superb guitar masterpieces. National Fingerstyle Guitar Champion Pat Kirtley has assembled a unique collection of favorites from Chet's "Golden Era" and teaches you all the secrets of how to play them as well as how to duplicate the sound of the original recordings in this exciting DVD set! Pat carefully dissects each and every song and then puts them back together - step by step - so that you not only learn how to play them, but also get a sense of the feel and history of each unique solo guitar piece. Split-screen viewing allows you to study both the left and right hands in great detail. Tunes include: "Alice Blue Gown, Down Home, Drive In, Rose Ann, Somebody's Knockin', Trambone". Bonus performance by Chet of the following songs: "Makin' Believe, Say Si Si, Side by Side, The Poor People of Paris, Villa". Pat Kirtley Plays "Down Home"
Beautiful solo guitar arrangements include: "Morgan Magan, The Last Pint, Blind Mary, Shi Beg Shi Mhor, Moran's Return, Finn MacCool's Reel, Lord Mayo, Rodney's Glory, Voyage for Ireland, The Blarney Pilgrim, The Red-Haired Boy, Fannie Power, Planxty Irwin, The Rakes of Waterloo, Chase the Weasel, The South Wind, Sergeant Early's Dream, The Pretty Milkmaid". Pat Kirtley Plays "Moran's Return & The South Wind"